Scientists and many delegates in Poland were shocked as the US, Saudi Arabia, Russia and Kuwait objected to this meeting "welcoming" the report. Keeping to the preferred target would need "rapid, far-reaching and unprecedented changes in all aspects of society". If warming was to be kept to 1.5C this century, then emissions of carbon dioxide would have to be reduced by 45% by 2030. 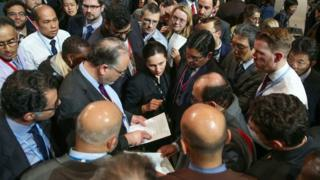 But negotiators here ran into serious trouble when Saudi Arabia, the US, Russia and Kuwait objected to the conference "welcoming" the document. Instead they wanted to support a much more lukewarm phrase, that the conference would "take note" of the report. "It's not about one word or another, it is us being in a position to welcome a report we commissioned in the first place," said Ruenna Haynes from St Kitts and Nevis. "If there is anything ludicrous about the discussion it's that we can't welcome the report," she said to spontaneous applause. "We are really angry and find it atrocious that some countries dismiss the messages and the consequences that we are facing, by not accepting what is unequivocal and not acting upon it," said Yamide Dagnet from the World Resources Institute, and a former climate negotiator for the UK. "Climate science is not a political football," said Camilla Born, from climate think tank E3G. "All the world's governments - Saudi included - agreed the 1.5C report and we deserve the truth. Saudi can't argue with physics, the climate will keep on changing." Many delegates are now hoping that ministers, who arrive on Monday, will try and revive efforts to put this key report at the heart of the conference. "We hope that the rest of the world will rally and we get a decisive response to the report," said Yamide Dagnet. "I sincerely hope that all countries will fight that we don't leave COP24 having missed a moment of history."